Baby Milk Action coordinates the Baby Feeding Law Group (BFLG) monitoring project in the United Kingdom. Our latest monitoring report is Look What They’re Doing 2017. Our UK Monitoring 2016 report is included in our Update 47 newsletter. Also see the BFLG monitoring reports for past examples of how baby food companies violate UK marketing rules and international standards. We welcome reports of violations to Baby Milk Action. Click Here for a Press release about the UK Improvement Notices http://www.babymilkaction.org/archives/10328. The Statutory Instruments that came into effect on 20th July 2016 in England and Wales make Improvement Notices legally binding. See our press release for details. Scotland’s Statutory Instrument also makes certain provisions legally binding, but does not provide for warnings through Statutory Instruments. These handy cards available in our Monitoring Kit give an overview of the marketing rules, as below. Carry the card with you or bookmark this page, then take a picture and email us anything that breaks the rules. advertise infant formula to the public or make the brand or ingredients the main focus in follow-on formula advertising to the public (RG 21/GN 48). promote infant formula at point-of-sale by special displays, shelf talkers or discounts etc (follow-on formula products and promotion should not be placed by infant formula). (RG 20/GN53). 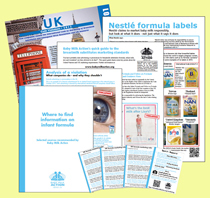 promote infant formula in mailshots or emails to the public, even when the recipient has agreed to receive communications (ASA ruling A12-197524). put health and nutrition claims on labels (unless on a small list of permitted claims) or use other idealising text or images on infant formula (such as hearts, shields, animals) (RG 17/GN 32). pay for television programmes to show their infant formula or follow-on formula products. target health workers with gifts or idealising product information (RG 21) (be wary of company events, sponsorship and reps wanting to meet). provide information materials for use in health facilities without prior written approval from the Secretary of State for Health (RG 24/GN 74-79). See the indicated paragraphs of the RG: Infant Formula and Follow-on Formula Regulations (2007) and GN: Guidance Notes for the Regulations. (Follow the links from the BFLG website). Companies should also comply with the stronger UN minimum standards. The above information is included on our pocket-sized ‘spot it – report it’ cards, with advice on how to report a violation. Four cards (one of them laminated) are included in our Monitoring Kit with other useful resources explaining the regulations. The explanatory memorandum for this legislation states that its purpose is to “remedy deficiencies in UK legislation relating to nutrition, arising from the withdrawal of the UK from the European Union (EU) in the event that the UK leaves without a deal having been agreed”.